Marinate fish in a mixture of lemon juice and salt half a teaspoon of turmeric powder for about fifteen minutes. Heat two tablespoons of oil in a pan and shallow fry till half done. Drain and set aside. Soak one cup of scraped coconut in one cup of warm water for three to four minutes. Grind and squeeze to extract milk. Heat oil in another pan. Add onion and sauté till soft. Add half the remaining turmeric powder, half the red chilli powder, two tablespoons of scraped coconut and salt and sauté for two to three minutes. Add two cups of water and let the curry simmer. Add a little more oil to the oil in which the fish pieces were fried. Add mustard seeds, green chillies, coriander powder, remaining red chillli powder, curry leaves, remaining turmeric powder, raw mango slices and sauté. Strain the onion curry into this tempering, pressing well to extract all the flavours. Add the fried fish. 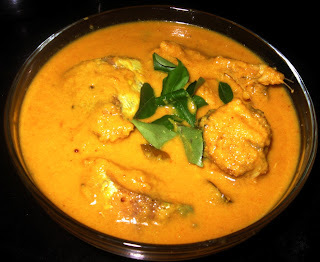 Mix the rice flour with quarter cup of water to make a smooth paste and add it to the curry. Cook stirring continuously till the curry thickens. Add coconut milk and stir. Add a little tamarind pulp and let the gravy come to a boil. Switch off the heat and garnish with coriander leaves.